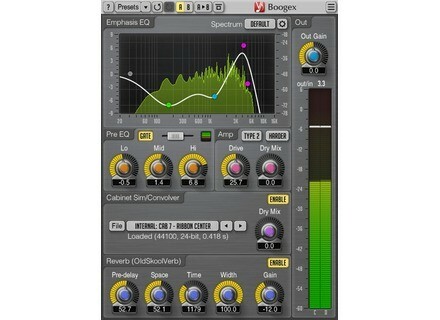 Boogex, Software Amp Simulator from Voxengo. Voxengo has updated its free Boogex guitar amp simulator and effect processor to v2, almost 10 years after the release of v1. This new version of Boogex includes an improved amplification algorithm, with 10 processing modes that allows for jazzy saturation to heavy distortion, with a very low latency. The VST and AU plug-in for Mac OS X and Windows also features en Emphasis EQ, a reverb, 61 cabinet impulse responses and it supports stereo processing and all sample rates. Internal processing resolution is 64-bit floating and a preset manager is included. Boogex is waiting for you at www.voxengo.com. The NI Komplete Audio 6 on sale Native Instruments lowers the price of its Komplete Audio 6 USB interface until December 31st. 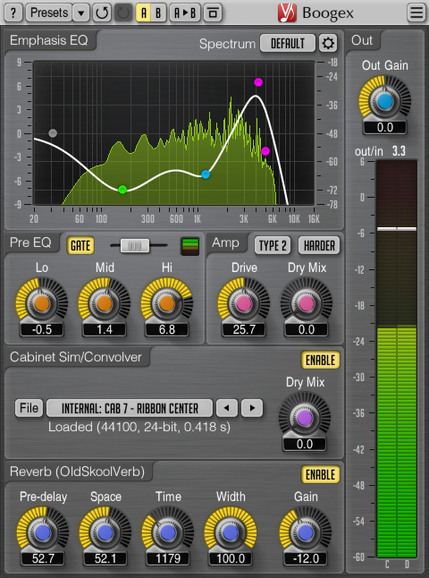 Our readers' choice of the best commercial convolution reverbs Of all the reverb types on the market, convolution reverbs are perhaps the most intriguing, because their sounds are based on impulse responses from actual spaces such as concert halls, recording studio live rooms, gymnasiums, you name it. The following is a list of the top five convolution reverbs, as chosen by the Audiofanzine community. TouchAble app for live updated to v3 AppBC has released version 3 of its TouchAble remote control iOS apps for the Ableton Live DAW.